Ultra-portable yet stable observation mount. 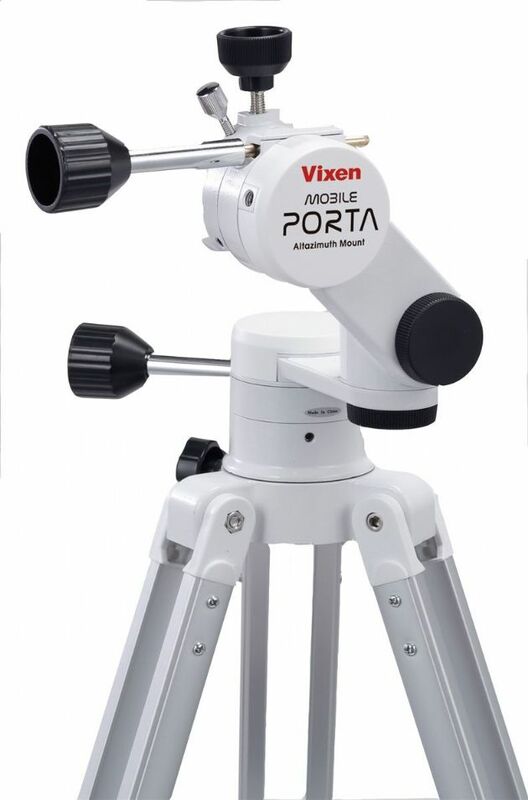 Vixen’s Mobile Porta altazimuth mount at only 2.4kg (including tripod) is the lightest weight and most affordable mount in the range and is perfect for "grab and go" observing. The mount head and tripod sections are detachable for transportation and storage but the complete system can also be transported in an optional carry bag. Using the same friction-based adjustment system as the larger Porta II mount, the telescope can be quickly moved into place by hand. Unlike some competitor models, the Mobile Porta also includes slow motion handles for fine adjustment and tracking. The new multi-arm design eliminates the problem of blind spots in altitude adjustment and makes the mount more compact when being transported. As with all Vixen mounts, the Mobile Porta uses the now “world standard” dovetail mount system and will carry a payload of up 3.5kg. The maximum recommended tube diameter is 120mm*. *Maximum usable tube diameter will vary depending on tube length and weight as well as tube type. The mount is supplied with a circular accessory tray with cut-outs for eyepieces. It can also be used to store small photographic accessories. The tray attaches and detaches via a single center-mounted screw.